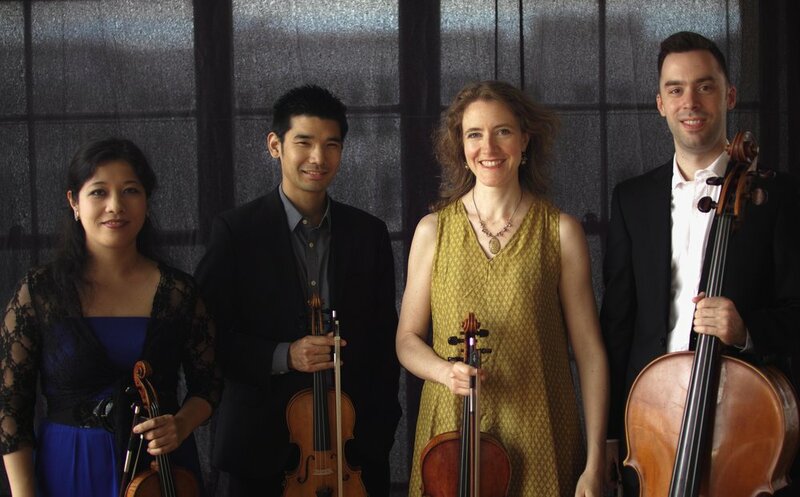 The young and immensely talented Momenta Quartet arrange four programs each year about this time, each curated by a member of the group. That is, they arrange the music, get a few guest artists and give short informal talks before each work. That is kind of normal. The originality of the Momenta Festival is in the selections. As you can see in the coda to this story, the works are mainly contemporary–a few written or arranged by members of the group. You might have one medieval work (ditto). Or Wagner (Ditto again.) Or a rare work by the man who Yehudi Menuhin once told me was the greatest musician he ever knew, Georges Enescu. Last night was titled Canciones, for good reason. Each work on the first half was based on song. Each was diverse, original, and played with fierce–but somehow light-hearted–energy by the Momenta Quartet. Their guest was soprano Lucy Shelton, an old friend of Mr. Shiozaki (he originally wanted to the program “I Love Lucy”) and a singer of domineering power. Power which was lost, alas, in the work by Spanish composer Cristóbal Halffter, Canciones de al-Andelus. This was hardly Ms. Shelton’s fault. But the three poems–by two Medieval Spanish Jews and one 15th Century madrigalist–were sung in the original language, and we had no translations until after the performance. That was unfair, since the atonal drama, the sudden changes in emotion, the vocal treatment all seemed to illustrate the poems themselves. If one had to choose a single piece, Ms. Shelton’s Tres morillas (Three Moorish Girls) was most memorable. The words were hardly emotional, but the sounds of the Quartet and Ms. Shelton were almost whispered, one felt a windy desolation, a strange music from the composer. Ms. Shelton returned with three more songs, a suite for soprano and solo violin by Heitor Villa-Lobos. Now the problem with Villa-Lobos was his fecundity! He might well have bettered the most prodigious composer in history, G.P. Telemann. In fact, the only time he stopped composing was to light a cigar. Otherwise (in Biblical language), his pen and his staves comforted him. Which also meant that, while all his music was original, not all of it was great music. Thus, one fears each unheard work. Not to fear last night. This Suite for Violin and Soprano, written during his halcyon days in Paris, is an extraordinary piece sung with extraordinary vigor by Ms. Shelton, played with daring virtuosity by Mr. Shiozaki. The violin part always was skirting Bachian harmonics, complex counterpoint. Ms. Shelton was unconfined. Limitless in the passion of the first song, in her wordless Vocalise. The final Girl of the Sertão seemed to be partly nonsense syllables, but were spoken, chanted, given such an electrifying performance that it would make a Gilbert and Sullivan patter-song seem like a Palestrina dirge. Mr. Shiozaki’s one solo work was based on a poem written by composer Anne Clyne’s mother on her deathbed. It is a poem of joy, of willing surrender, and inspired Ms. Clyne to write seven pieces called Violin. This Rest These Hands began with a drone on one string, with a striking melody on the others, and with a central part which–like the Villa Lobos–was became a 20th Century Bach partita reverence. A gorgeous work, as reverent as the poem. Now in a program called Canciones, one would hardly think of including Mr. Beethoven. Yet this was Beethoven–like Ms. Clyne’s mother–on his deathbed perhaps, but filled with songs. A “German” song, one cavatina, one opening movement which was as extreme as the music of Mr. Halffter. This was where the Momenta’s youthful sense of lightness came to the fore. The opening was like a Haydn practical joke, played for surprise. The presto was light and snappy, the German dance was charming, the cavatina was...well, for a slow movement, rather fast. The Momenta Quartet chose not to play the original Grosse Fuge, but ended with Beethoven’s substitution. After such a joyous program, I was personally happy about that. Beethoven’s final work had the joy which he must have felt between a life fulfilled and an eternal life hereafter. The Momenta played it with such facility that one almost didn’t notice how impossibly difficult the counterpoint and little fugue could be. It was the terrific finale for the program. But look below for more holiday gifts. Newer PostChelsea Opera presents the New York City premieres of "Josephine" and "After Life"